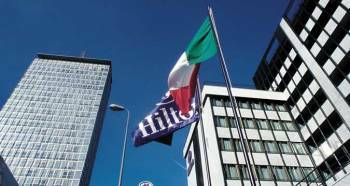 The Hilton Milan hotel is the perfect base to discover the exciting, sophisticated and cultural city of Milan. Located only one block from the Central Train Station and just two miles from many Milan attractions, this hotel is set in an ideal location.Visit local attractions such as La Scala opera house and Sforzesco Castle as well as Milan’s famous fashion district, all within walking distance from this Milan hotel. Retire to a spacious guest room, suite or executive room at the Hilton Milan hotel, perfect for couples, families and business guests alike.Each room features contemporary, bright and airy décor and wireless internet access. Upgrade to an executive room for exclusive access to the Executive Lounge with its private terrace. Find all the facilities you need to do business at the hotel. Just one block from Central Station and airport bus links, the Hilton Milan boasts 13 meeting rooms for up to 200 guests, business center and nearby conference center with wireless internet access available throughout the building.As well as the many local attractions, work out in the 24-hour fitness center, experience a sightseeing tour or simply relax with a drink in the hotel bar or restaurant. Dine on authentic Italian cuisine at the Pacific Milano Restaurant and choose from á la carte dishes, buffet meals or freshly baked pizzas. Later, retire to the Cosmopolitan Lobby Bar Lounge and enjoy the cozy atmosphere with a glass of wine or Amaretto nightcap.